Exercise! It does the body good! Hello and welcome to our section of exercising. I am a huge freak for weightlifting and yoga. Oh and jumping. Dancing is nice too! Basically you will find lots of articles here about different ways to exercise. If you are looking for sports see our sports section. By Suzanne MacNevin, with notes from Charles Moffat. Now as you may or may not know I am a big fan of weightlifting and yoga, and a big supporter of all things that involve exercising. Well it just so happens I have a friend who is an archery instructor in Toronto - which I admit, is a pretty kewl job. Okay, technically he is a personal trainer in Toronto, but he has been doing archery for many years and then in 2010 he started teaching archery. Now if you ignore all the movies and TV shows that currently feature archery as part of the plot (Hunger Games, Arrow, Brave, Hanna, etc) then you can try and get at the heart of a sport which can be done purely as recreation or also used for hunting and fishing. The movies after all gloss over the years of training an archer goes through to get that good at what they do. And even if they do give you a hint as to how to hold the bow, how to aim, etc, they are really just giving tidbits of a sport which is for perfectionists. But if you love attaining perfection - especially when it is a challenge - then perhaps archery is a sport for you. The good news is that archery is a bit like weightlifting. 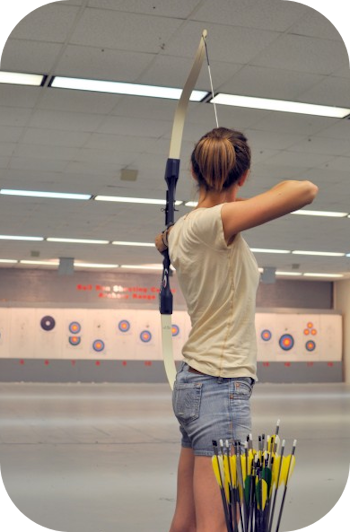 It uses a lot of upper body muscles in your back, shoulders and arms and if you've never pulled a bow before then it always harder than you expect to hold it steady while you try and aim. As exercises go it isn't very intense however. It is not like running a competitive marathon or powerlifting at the gym. You aren't going to break a sweat unless it is really hot outside. 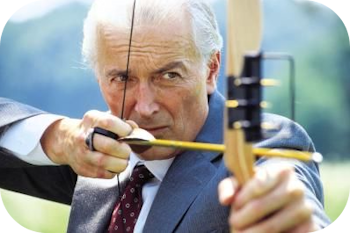 So you get the benefits of weightlifting, but you aren't overstressing yourself - which is good because it means elderly people can do archery too, without any worries about possible health problems. And for younger people, who perhaps want to challenge themselves a lot more, you can always get a more powerful bow which requires more effort to pull it and the arrows zoom out of there with more speed and power. Thus a person can choose to challenge themselves as much as they want to. They also can choose what kind of archery they want to do - recurve, longbow, shortbow, horse bow, olympic, compound. Traditional or modern. Plenty of options for the individual to explore what they like best. There is a trick however. Archery is a sport that relies largely on patience, and children are not known for patience. Thus if you are a bit immature and lack patience you need to understand that archery is a sport that takes years to perfect - and even then you will always be striving for perfection. So lets pretend your kids want to get into archery. Well, if your kids are known to be impatient then you are better off getting them a children's bow that they can just muck around with at the archery range. (And only at the archery range! Safety first!) However if your kid is of the more patient variety then you might be able to get them a junior recurve bow, or depending on how old they are a regular recurve bow. My friend recommends people learn recurve first because it is the easiest for beginners to learn proper form and how to shoot. The same thing goes for adults who have more patient. He still recommends recurve archery for beginners. Some beginners will want to jump straight into compound or olympic shooting, but that is a lot more expensive and you really should learn proper form, how to tune equipment, etc before spending a lot of cash on something you don't have a clue how to use - or worse, what equipment to buy or not buy. If you have more questions about archery I strongly recommend you visit my friend's website, CardioTrek.ca, and learn more about the archery tips he has on his website, and if you live in Toronto you can also get archery lessons from him.